The Funding Network - How is collective giving changing the face of our social sector? News : TFN in the media : How is collective giving changing the face of our social sector? How is collective giving changing the face of our social sector? Sometimes - like a champion sporting team, a virtuoso orchestra or a brilliant fighting force - all the elements blend together to create a performance greater than the sum of the parts. 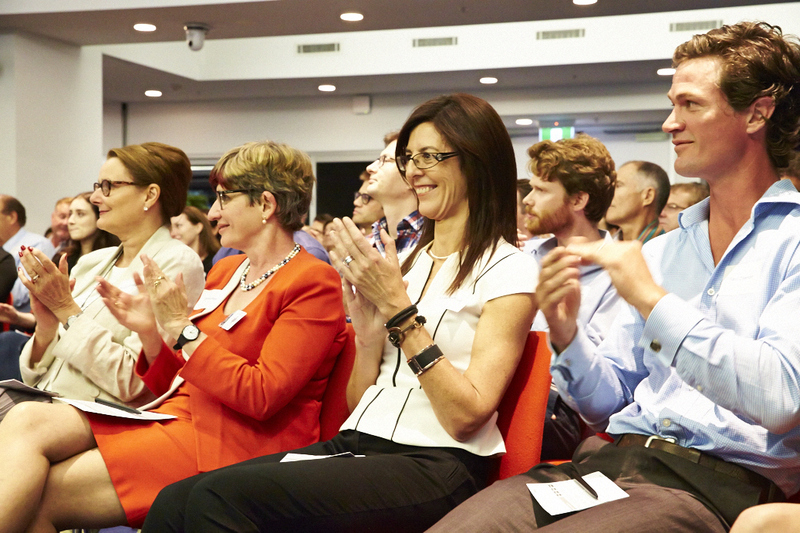 It happened last Wednesday night at The Funding Network Australia’s crowdfunding event held at Macquarie Bank’s Shelly Street office in Sydney. It was one of those rare and magical occasions - a showcase for the power of collective giving - that saw the 200-strong audience 'live pledge' more than $400,000 in 40 minutes for three pitching non-profits, which came seeking funding for projects in youth mental health, an East Timorese heath clinic and an Armidale-based youth intervention program. Our MC, the ABC’s mercurial James Valentine, set the scene with his gentle wit and guided us through a rollercoaster of emotions as the presenters told their wonderfully passionate, and often heart-rending, stories. Sebastian Robertson from youth mental health education provider batyr opened the pitching, supported by his former school principal Sam Di Sano, and spoke of the devastating impact of the “elephant in room”, mental health, and how batyr is working to de-stigmatise it. They were followed by Dr Chris Fenton from East Timor’s Bairo Site Clinic and two of his health workers, Sidalia Rego and Lidia Dos Santos, whose strength and dedication against so many odds captivated the room. Bernie Shakeshaft from Armidale’s Backtrack youth at risk program then told his tale in brilliantly laconic bush style, introducing us to one of his success stories, Tyson, who stopped us in our tracks with his chilling honesty. But, above all, it was a night chock full of heart-warming fun. It started with Cheezels, after Bernie noticed them among our host, Macquarie Group Foundation’s, superb finger food. It became a centrepiece of the night’s fun, especially during the pledging session, where people in the room voluntarily pledge donations from $100 to the pitching non-profits. Pledgers challenged those in the room to match their donations if they fell into certain groups - those who had one-eyed dogs, or came from the bush, or those who knew they were going to a safe, loving home that night. The momentum during the pledging was extraordinary as one by one, with big numbers and small, the audience stepped up to support the programs both financially and through in-kind support. A couple of timely interventions from the audience during the pledging added immense meaning to the night: a doctor who works in the East Timorese Clinic told of the human impact of the funding; and the compassionate magistrate who first sentenced Tyson to youth detention when he was just 14 years old and barely visible over the court dock told us of her delight at the changes she had since seen in him, especially after her fears at his prospects when she was forced to send him away. A wonderful combination of passion, enthusiasm and great spirit from the presenters, expert coaching by Rob Irving, magnificent MCing by James Valentine and a beautiful, generous and receptive audience combined to give an unforgettable evening, sending all who attended home with their hearts uplifted, especially when they heard that the three charities had bonded during their wait in the ‘green room’ and were planning a joint visit to East Timor to combine to provide their services there. The astonished look on the presenters’ faces when the pledging totals were revealed was worth the journey.